Ah Christmas present wrapping - isn't it wonderful? Well actually no, it isn't such a joy when it's the 24th December and you are faced with a small mountain of gifts which have been hidden in various places around the house that even you have forgotten about. You have three excited children that can't be trusted to stay in their rooms and that special bottle of Champagne has just been polished off. Cue Christmas Eve tantrums all round. The nifty Scotch Pop-Up Tape Hand-band comes in three colours - pink, silver or blue. The Scotch Pop-Up Tape range is available at leading supermarkets and stationery stores. 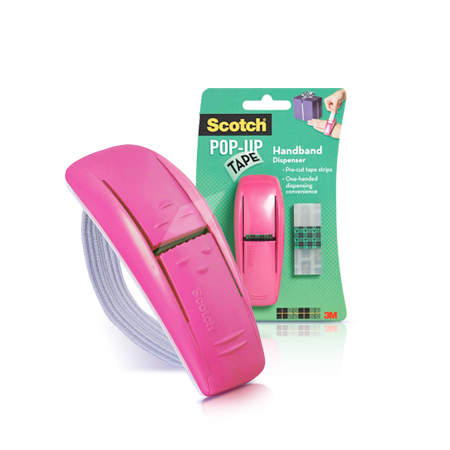 The Scotch Pop-Up Tape Hand-band Dispenser has an RRP of £2.49, whilst a pack of Scotch Pop-Up Tape Dispenser Refills, containing three tape pads, has an RRP of £2.69. For more info on their range of goods head over to the Scotch website or pop over their Facebook page to take part in their great new mystery gift competition. Disclosure: This is a sponsored post. Scotch also supplied me with hand dispensers, scotch tape, scissors and a number of other items for the purposes of this post.